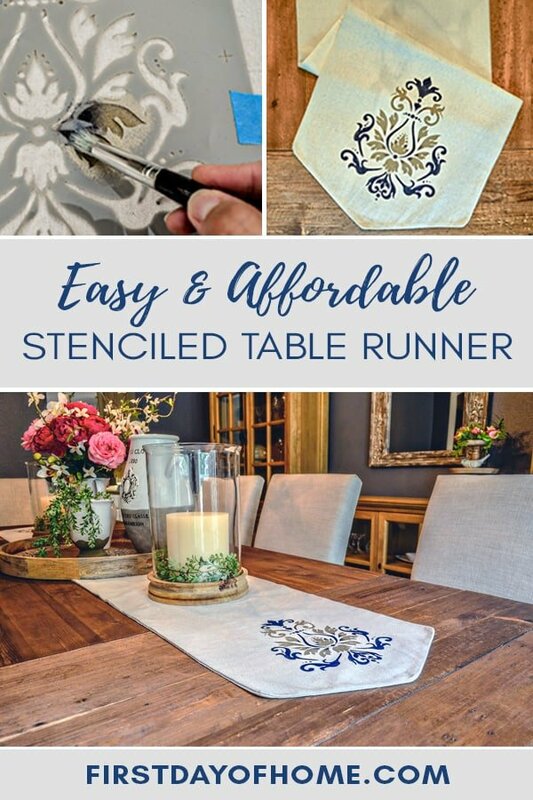 Today, I’m sharing a tutorial on one of my favorite DIY projects — an easy and affordable stenciled table runner. When we bought our rustic dining table, it looked very naked sitting beneath the chandelier. To take it from naked to at least scantily clad, I needed just the right table runner. 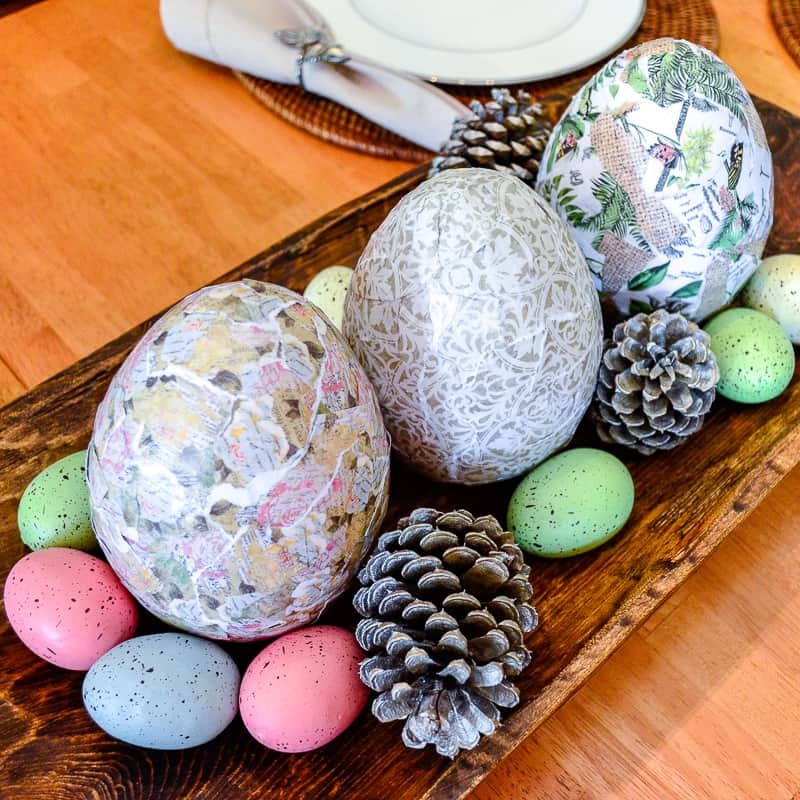 Then, a decorator friend told me about an unexpected (and inexpensive!) material I could use to craft my own runner. Problem solved! Drop cloth. I had seen Pinterest friends using drop cloths for curtains, but it never occurred to me to make a runner out of the stuff! The material has great texture and is very affordable. Acrylic paint. Choose any type of paint that fits your project. Just check whether it’s permanent or washable and buy whatever meets your needs. 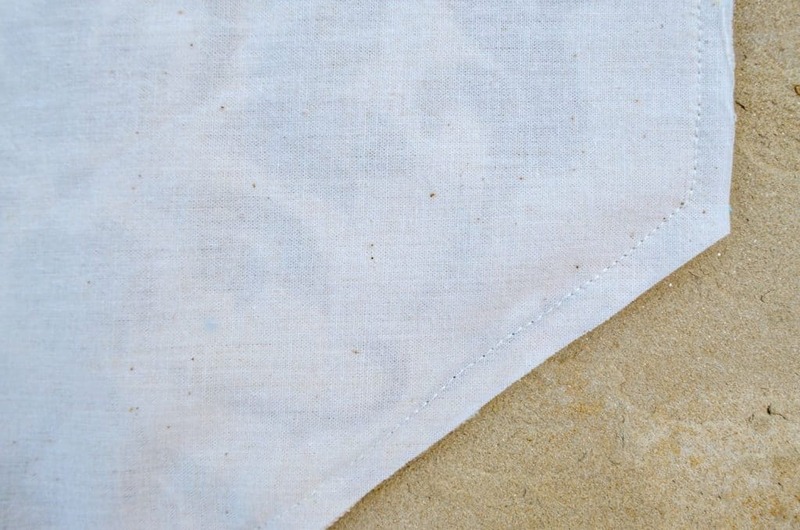 Unbleached muslin. I used this fabric on the underside of my runner for a more refined look. 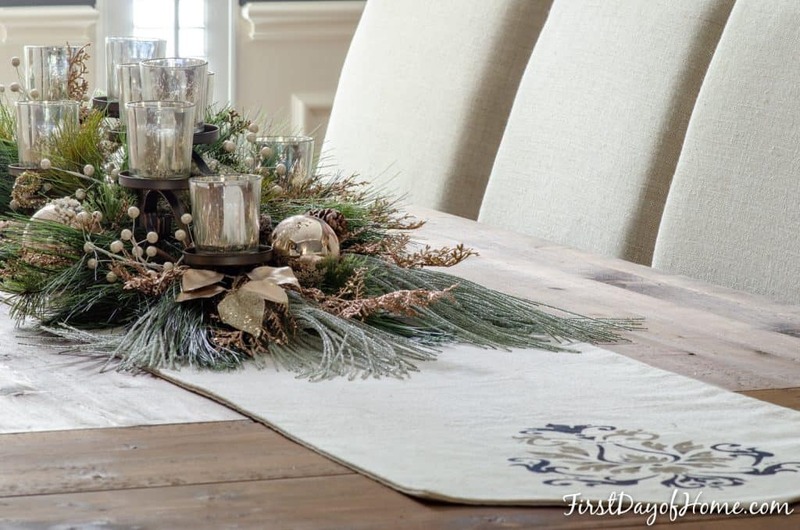 It’s perfectly okay to use a drop cloth for both sides or make a one-sided runner instead. Stencil brushes. I opted for bristle brushes over foam sponges because I felt they gave me more control. You’ll definitely need thick bristle brushes and not generic craft brushes. Fortunately, the drop cloth I bought was so huge I had plenty of material to practice with before making my final stenciled table runner. I started with one color but ultimately decided on a two-tone pattern. 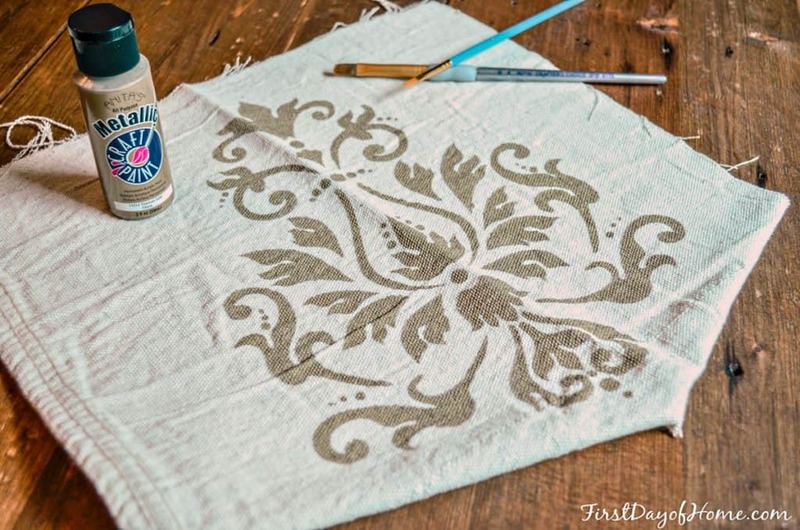 Before you begin, tape your stencil to the fabric around all edges to keep it in place. Then, dip your brush into water and squeeze out any excess. 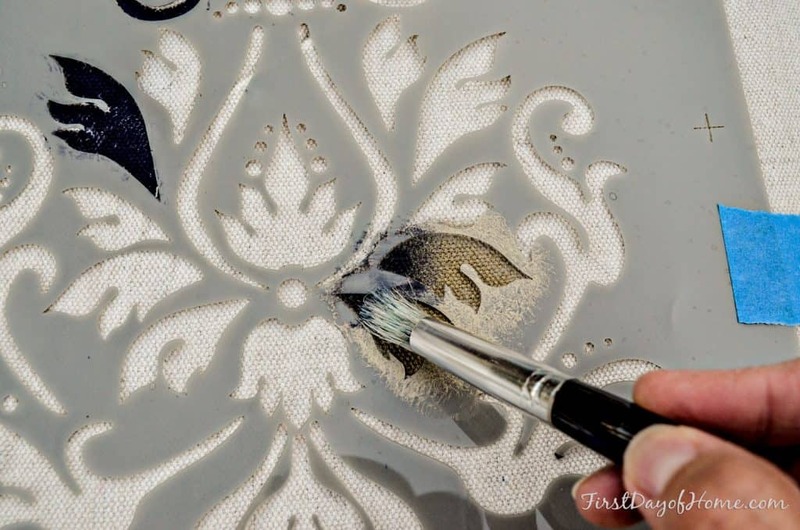 To keep the paint from bleeding past the stencil, start with very light coats holding your brush vertically. Press the tip of the brush into the fabric in a dabbing motion rather than painting with strokes. You can use a paper towel to absorb some of the excess paint on your brush if needed. 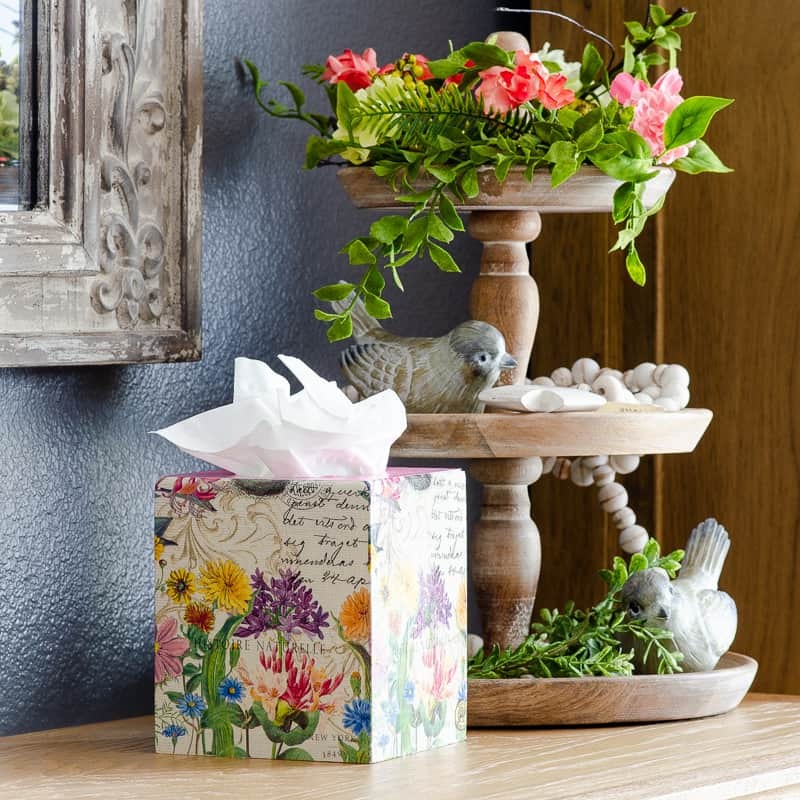 If you’re having trouble isolating your colors, try taping over the areas you don’t want to paint. To add more depth to my design, I gently applied some blue paint to the corners of my gold leaves. Before adding shadows or highlights, wait at least two minutes for the underlying color to dry. For best results, wash and press your fabric before you begin. Then, cut your drop cloth (and optional muslin) to the desired dimensions. Just remember to add a small seam allowance of about 5/8 to 1 inch on all sides if you plan to sew the edges. 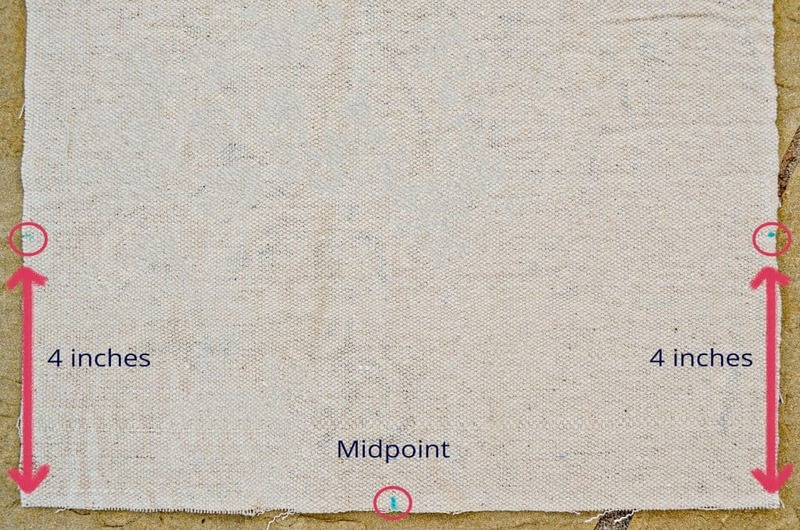 To make pointed ends on your runner, measure and mark the three points shown below. Then connect the points and cut along the lines. I typically fold my fabric in half lengthwise so I can cut both ends of the runner at once. With a rotary cutter and ruler, it’s easy to make clean, straight cuts. 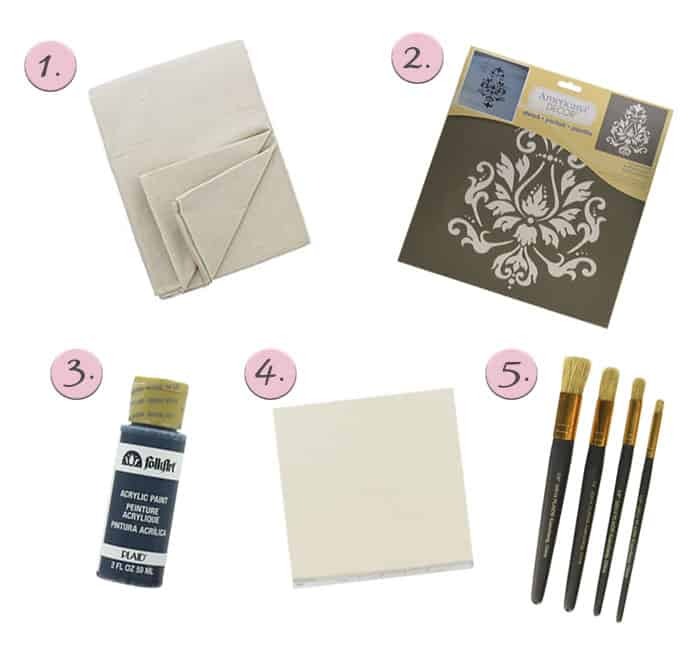 You’re now ready to apply your stencil, which you’ve already practiced doing in step 1. I like to paint before sewing, in case I have an “oops” moment. 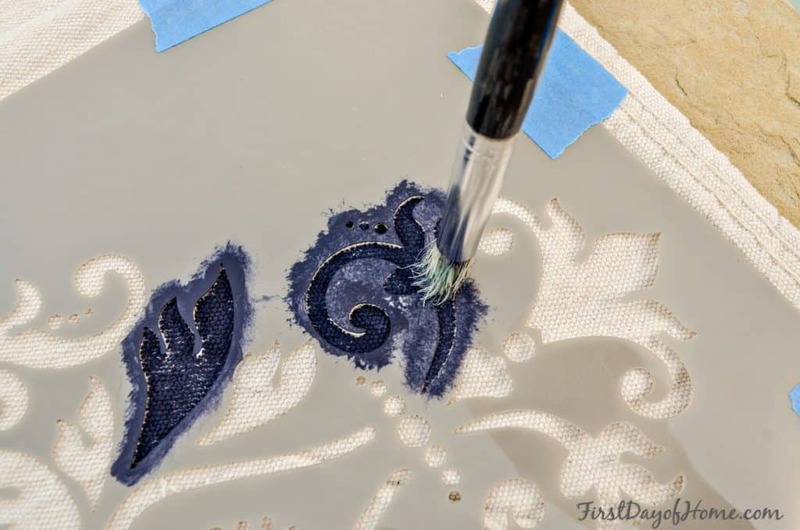 After stenciling, wait a few hours for the paint to dry before completing your project. If you have a sewing machine and want to make a two-sided runner, line up your two pieces of fabric with the right sides facing each other. Then, pin your fabric together and sew around the edges with a 5/8 to 1 inch seam allowance. Here’s a look at the muslin side of my runner after stitching. You’ll need to leave an unstitched opening of about 4 inches on one side so you can turn the runner right-side-out again once you’re done sewing. 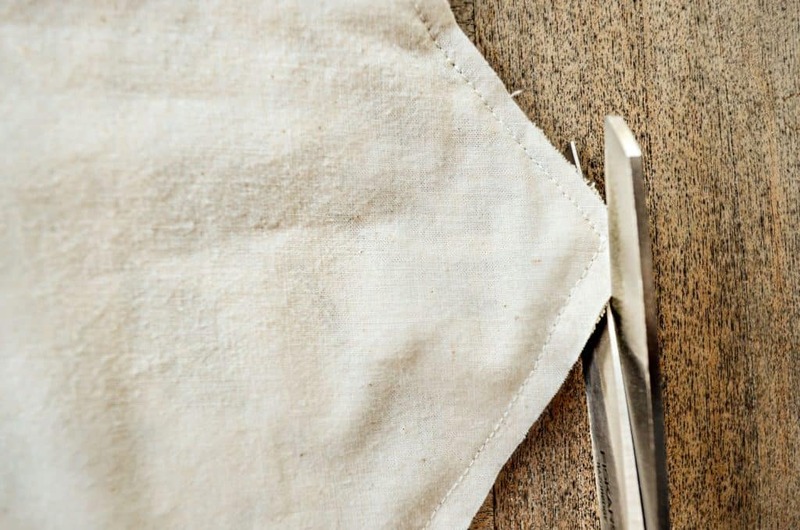 Before turning it, trim any pointed edges closer to the stitching to reduce bulk. After flipping the runner right-side-out, close the 4-inch opening with an invisible stitch, and you’re done! Fortunately, this custom runner works for all seasons. I’ve even used it beneath my DIY mercury glass holiday centerpiece. 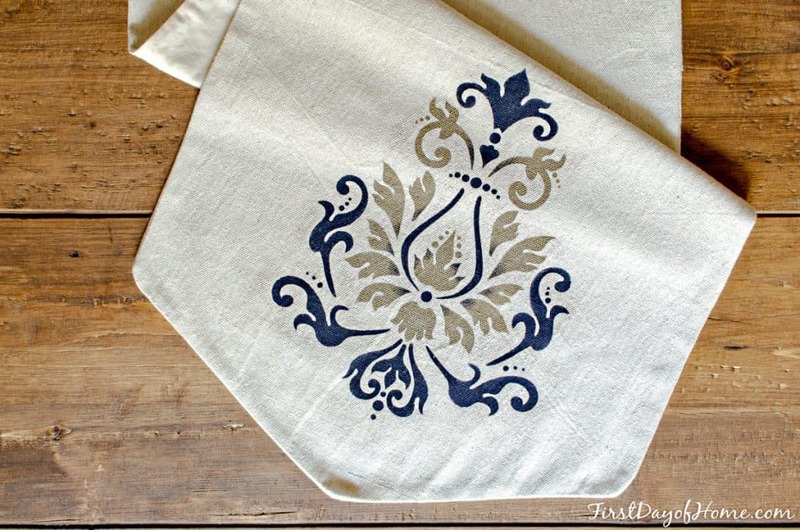 If sewing isn’t your thing, try using Dritz Stitch Witchery to “hem” the edge of your stenciled fabric. 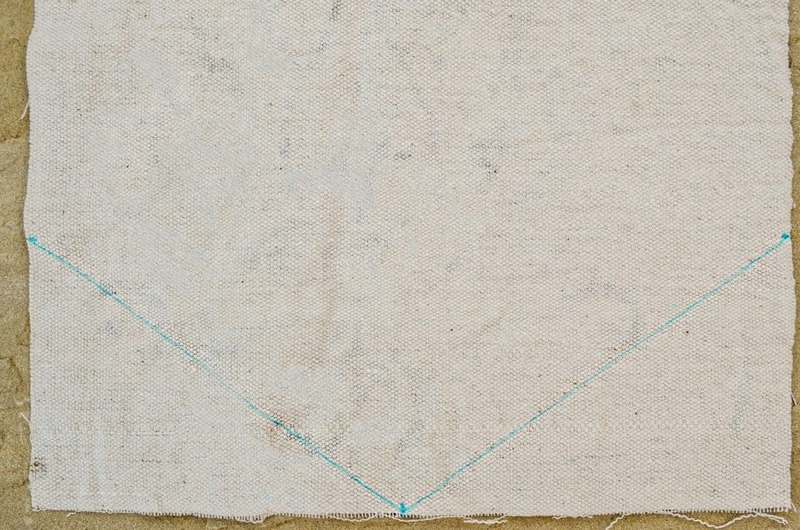 When applied with an iron, this tape acts as an adhesive to fuse the edges of fabric together. Just be sure to remove all of the plastic wrapping on the roll, wet the tape generously, and use either wool or cotton settings on your iron to press for 10-15 seconds. You may need to press again if the tape doesn’t adhere well the first time. 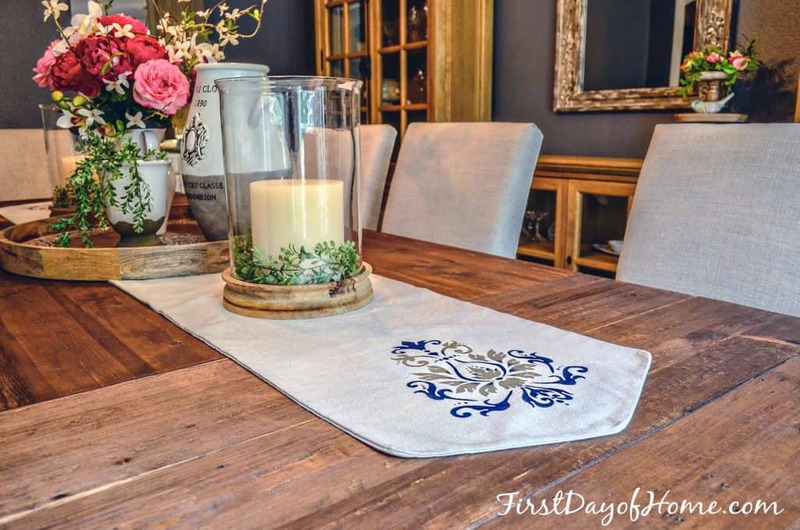 What I love about this DIY stenciled table runner is how customizable it is. 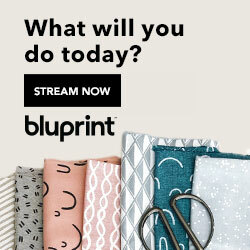 I can’t wait to see what creations you dream up for your very own, unique table runners! 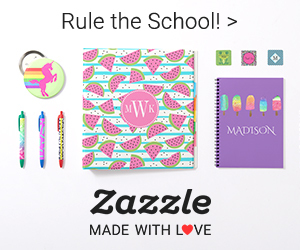 If you like what you see, please pin, tag and share! This is so pretty! And I love that it’s a simple, very doable project that costs so little. Thank you for the step-by-step instructions. 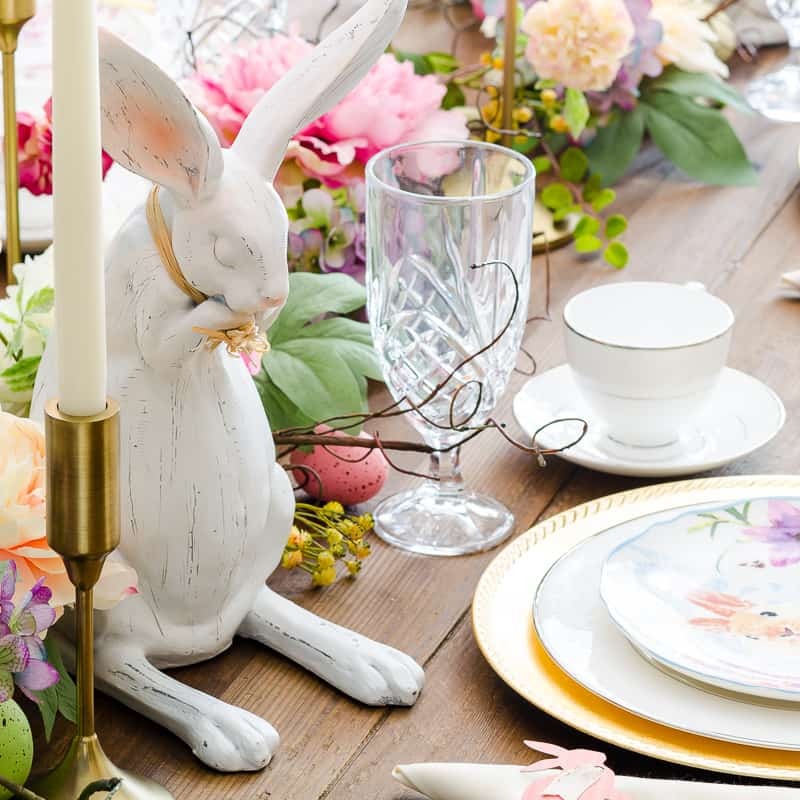 Such a lovely table runner… I don’t know how I missed this post… but I totally remember seeing the project! Pinned! Thanks, Julie. I did this post early on when I started blogging and recently updated it. I appreciate you pinning! 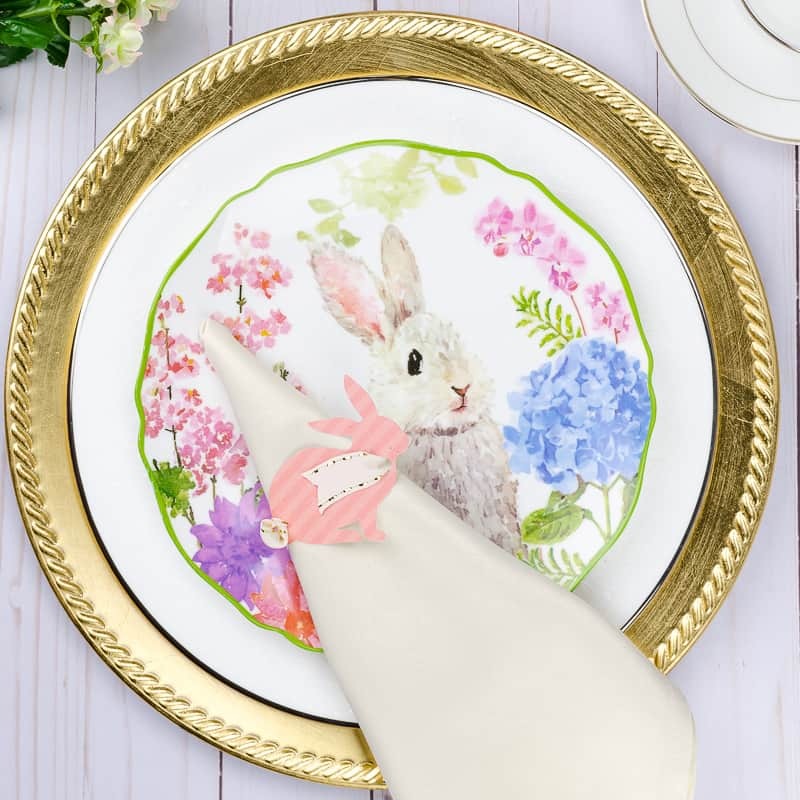 Your table runner is very pretty! Great tutorial! Thank you, Lauren! I’m glad you liked it. It’s a fun and easy project.